I very much enjoy bicycles and cycling, but I’m not hugely fussed about the racing or sporting aspect of it as I am about bicycles as transport. I’ve owned a few bicycles in my time, most of them with practical but very unfashionable accessories such as mudguards and racks. But the one item that has revolutionised my cycling is the front rack you see in the pictures. It was bought from a very small US firm called Cetma as there is nothing else like it on the UK/Ireland or even European market to the best of my knowledge. It means I can more or less cut out the car for short journeys around town, which mainly means trips to the supermarket/convenience store, and to pick up my 2 year old from childminder. Most shopping loads are doable. 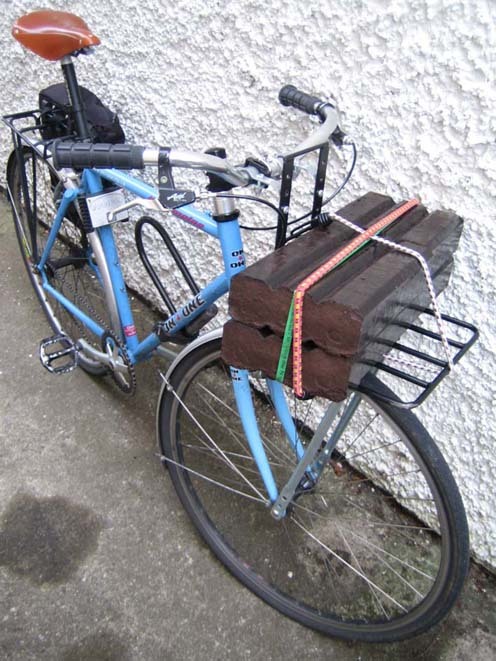 I’ve even managed to cycle 1km from the petrol station back to my house with a heavy load of peat briquettes.